All DACA students want is to feel just a little more like America’s child. When Donald Trump became president, I wrote him a letter with my story, explaining how terrified DACA students and immigrants all around America were. I’m still living in my story. Every day is a new page to this chapter in my life. I hope one day I can become a citizen of this country. I haven’t given up, and I’m not going to anytime soon. I remember watching “Spongebob” as a child of three, recently arrived in the U.S. from Mexico, and not fully being able to understand. My mom had just had my brother, and we were sharing a small apartment with my tia until we could afford a house for ourselves. At a certain point, after some struggles and successes in America, I began to understand “Spongebob,” my teachers, and my classmates. 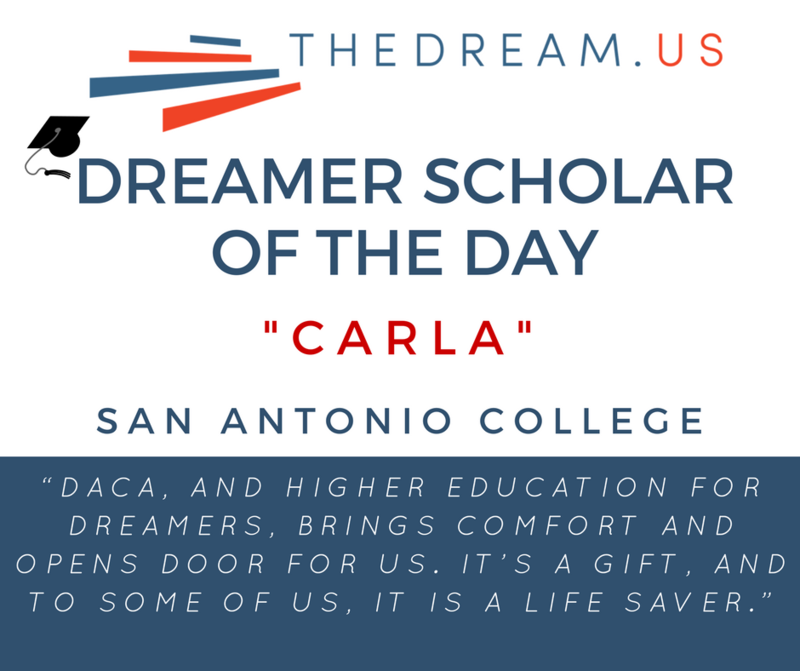 I received DACA in 2016 and arrived at San Antonio College by way of TheDream.US. I plan to become a registered pediatric nurse. Growing up as an undocumented student, I understand the patience and bravery that it takes to push through high school and receive higher education. I hope I get the chance to become a mentor to a group of undocumented students, and help them realize that the work is worth it. I think one of the hardest parts of moving to the United States was that my parents had to give up their families and friends. They had to start over and do everything on their own: babysit, buy a home, clothe and feed their children, all in a country where they did not even understand the language. Eventually, they both attended school and started learning English. In middle school, I wanted to go out of town for a school trip. My mom kept insisting I stop asking her. She kept repeating to me, “No tienes papeles mija”. I did not understand what she meant until she finally explained, and told me that I could not tell anyone. Around this time, I fell ill, and the doctors could not figure out what was wrong. I did not have insurance, and hospital bills were accumulating. During that time, I felt guilty for all that my parents had to pay on my behalf. Thankfully, I got well, but the image of my mom hunched over white envelopes with her brow furrowed is forever etched into my memory. DACA, and higher education for DREAMers, brings comfort and opens door for us. It’s a gift, and to some of us, it is a life saver.